In a measuring cup whisk together the coconut aminos, brown sugar, and mirin. In a small frying pan, heat the sesame oil on medium. When the pan comes to heat, turn to low and add the steak. Cooking just until the edges have browned and the middles have become grey. Add the garlic and ginger and toss with meat. Add the liquid mixture and bring to a simmer. Simmer until liquid mixture has reduced down by at least 1/3, about 10-15 minutes. Add the red chard, toss to coat with sauce, and cook until soft. 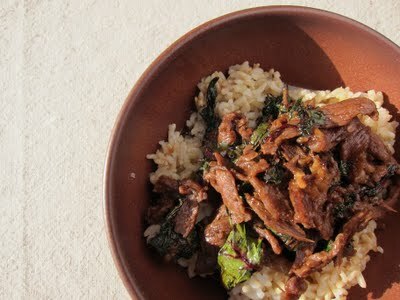 Remove from heat and serve over brown rice, drizzling with leftover sauce from pan.